I saw the recipe on this blog the other day and it reminded me of when I was studying in England, (3-4-5-10 years ago, no more, I swear) and we had an assignment to promote maltesers, so we had to prepare a small advertising campaign or something like this (I can’t remember more details, I guess the information was on those brain cells that have been destroyed / replaced by new information throughout the years). We ate several bags of maltesers trying (unsuccessfully) to brainstorm and come up with some good ideas .. anyway ….we managed to get a decent grade and pass the class, but I don’t think I’ve put a malteser in my mouth ever since. Flash forward to this week …. I saw this recipe and it “clicked” because I wanted to make something for my mom’s birthday, but not something too elaborate that will require me spending 5 days and nights in the kitchen, and not too chocolatey, because I have been making too many sweets with chocolate lately. It was also a good opportunity to broaden my “repertoire” and try something new (translation: I did not have time to make the super-duper cake , I saw in a well known pastry publication). 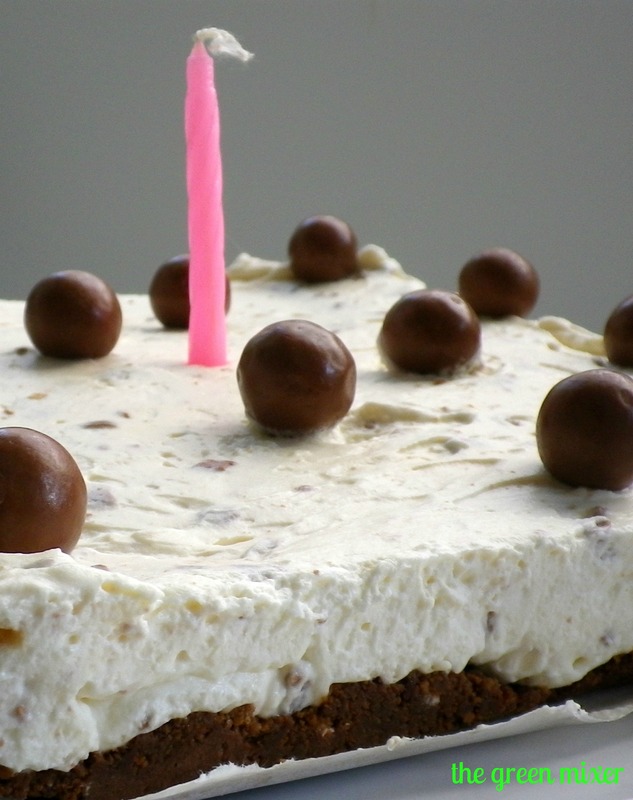 A crunchy and yummy vanilla cheesecake with maltesers, which we will call from now on a Malteese cake ….. (as soon as I popped one malteser in my mouth, the brainstorming began). ·The butter in this recipe is thrown cold in the food processor, along with the crashed cookies (it all comes together like a crumble), but there are variations out there that require you melt the butter and mix it with the cookies. I have not tried the latter method, so I don’t know if it works best. 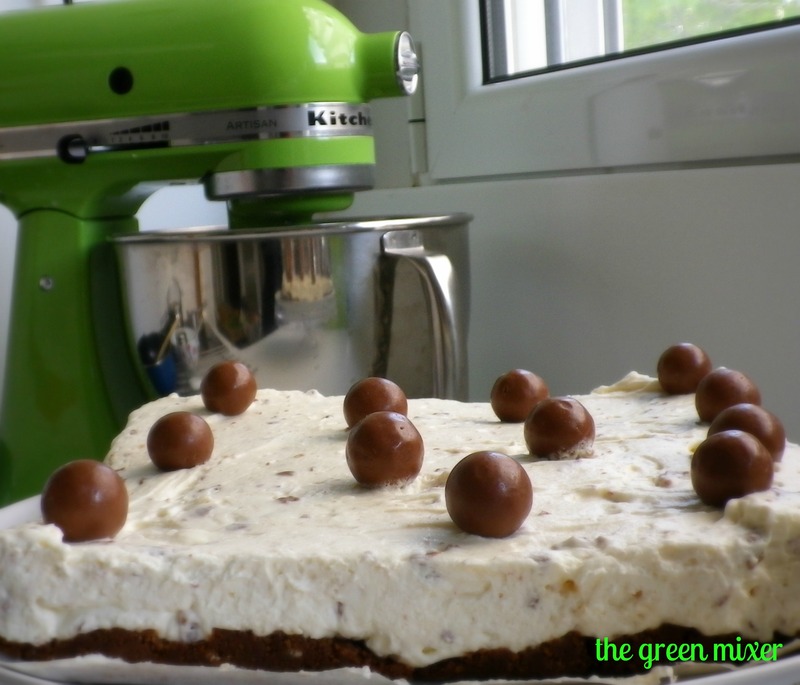 · The original recipe calls for a 23cm/9″ round spring form pan, but I used my square brownie pan (20cm/8″) which was lined with greaseproof paper hanging from the sides,to make it easier to pull it out before serving. Put the cream in a bowl and beat with the mixer (whisk attachment), on high speed until thick (to resemble the texture of yogurt). In a separate bowl, beat with the mixer on medium speed, the sugar with the cream cheese until light and fluffy. Add the vanilla and beat some more. With a spoon or spatula, add the whipped-cream to the cream cheese mixture, little by little little and stir/fold gently until incorporated. Put 1 pack of maltesers in the food processor and pulse a few times until crashed. Gently fold them in the cream/cheese mixture. Put the bowl with the filling in the fridge to firm up, while you make the base. Crash the cookies in a food processor. Add the butter and continue beating until it all comes together (it will resemble a crumble mixture). Press into pan with the back of a spoon or your fingers. (if it sticks on your hands, put it in the freezer for 2-3 minutes). To assemble, pour the cream mixture over the base and spread it around evenly. Bang the tin on the work surface a couple of times to make sure that there are no gaps. 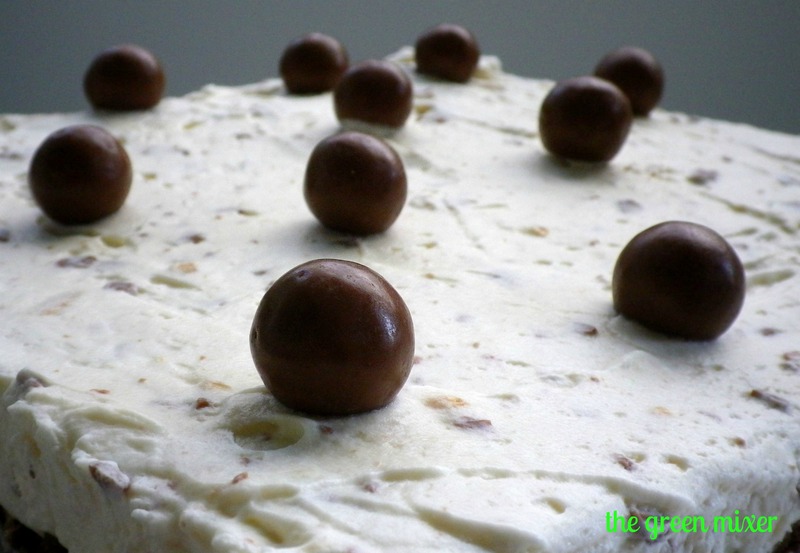 Refrigerate for at least 3 hours to firm up and before serving it, decorate with the rest of the Maltesers.